1. Launch your web browser and open the page containing the image. For example, open this page: "http://www.axialis.com/cursorworkshop/web-images.html". Right-click on the image, choose "Properties". A window opens. Right-click on the "Address (URL)", choose "Select All" then press Ctrl+C. Close the window. Right-click on the image, choose "Copy Image Location". Right-click on the image, choose "Copy Image URL". 3. Back in CursorWorkshop: In the Recently Used zone (in the main toolbar), paste the image URL, hit Enter. Choose File/Download or press Ctrl+D. Paste the image URL and click OK.
5. The image is opened in a document window. Images that are downloaded from Internet by CursorWorkshop are stored in a temporary folder and deleted when you quit the application. If you want to permanently keep the files, you must save them in a different location or add them to the Librarian using a "Save As" command. 6. If your image is opaque, you can create transparency areas. For example, in the page "web-images.html", the file "bw-hand.gif" is opaque on a white background. Using the following tutorial, you can easily transform the white background to transparency: Add Transparency to an Opaque Image. 1. Type the URL of the page containing the image in "Recently Used". 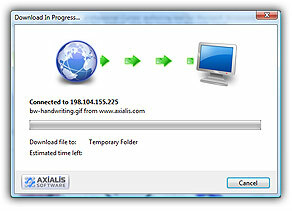 For example, open this page: "http://www.axialis.com/cursorworkshop/web-images.html". 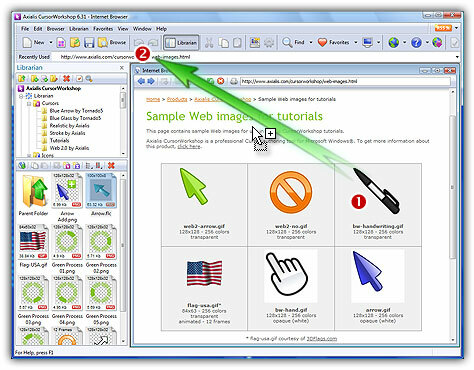 Open an Internet Browser window in CursorWorkshop: File/New/Internet Browser or press Ctrl+B. Navigate on Internet until the page is displayed. 3. The image is opened in a document window. Images that are opened that way are located in the "Temporary Internet Files" folder. Files in this folder can be deleted by Internet Explorer at any time. If you want to permanently keep the files, you must save them in a different location or add them to the Librarian using a "Save As" command. 4. If your image is opaque, you can create transparent areas. For example, in the page "web-images.html", the file "bw-hand.gif" is opaque on a white background. Using the following tutorial, you can easily transform the white background to transparency: Add Transparency to an Opaque Image. 2. Right-click on the image you want to open. For example, right-click on bw-handwriting.gif. Choose "Copy". 3. Back in CursorWorkshop: Choose "Edit/Paste as a New Image" or press Ctrl+Shift+V. 4. The image is opened in a new document window. When you use the clipboard to retreive an image the transparency is lost. As a result, the image is opaque. 5. Using the following tutorial, you can easily transform the white background to transparency: Add Transparency to an Opaque Image.